Shopping trips tend to be fairly safe. You drive to the store, pick up the items you need, pay for them and drive back home. Most shoppers aren’t in any danger during the course of a shopping trip unless they end up in a car accident. However, some people do suffer from shopping injuries while at a store. Shopping injuries are more common than you think. Thousands of shoppers become victims every year. Shopping injuries can happen in a variety of ways. If you were in a store and you suffered an accident that led to serious injuries, it’s possible the store owner could be held liable for the damages you suffered based on the principle of negligence. Slips and falls. Wet floors, debris, poor lighting, escalator malfunctions and torn flooring can cause customers to slip or trip and fall. This is common on major shopping holidays such as Black Friday and during the Christmas season. Too many people rushing toward a sale item can lead to trampling. Shopping cart mishaps. Shopping carts can tip over or get stuck, causing injuries to others. Falling displays and objects. Items that are stacked too high can topple over and fall on customers, causing head and neck injuries. Parking lot accidents. A parking lot with huge cracks or snow or ice that has not been cleared is a danger to customers. 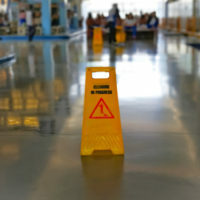 While these issues occur outside of the store, they can still lead to slip and fall injuries. Retail establishments and other types of businesses must abide by premises liability laws. Under these laws, store owners have a duty to ensure that the premises are reasonably safe. This means clearing parking lots from ice as soon as possible after a storm, cleaning up spills promptly and quickly fixing stairs and aisles that are broken and could cause injuries to customers. The store owner should have known about the hazardous condition. The store owner breached his or her duty by failing to inspect the store or provide adequate maintenance. The dangerous condition caused the shopper’s injury. The shopper suffered damages due to the dangerous condition. However, if you caused the accident due to your own negligent or reckless behavior, then you may not receive compensation. A simple shopping trip should not end with you in the hospital. If you were injured inside a store or in the parking lot, it’s important that you obtain compensation to help pay for damages. If you suffered shopping injuries due to the negligence of a retail establishment, know your legal rights. The personal injury attorneys at Mander Law Group can assess your case and help you obtain the compensation you deserve for medical bills, lost wages and other damages. Contact our Dade City office and schedule a free consultation by calling (800) 557-0411.